g-autoparts has no other items for sale. 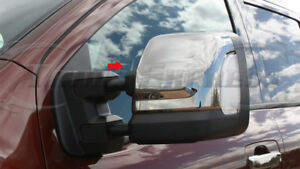 Our mirror covers will fit on Tow Mirror ONLY. Notes top half mirror covers: left side right side - with signal light cutout on the sides. APO, FPO, VI, GU. Our chrome accessories can not be re-applied after your initial installation. Peeling off the chrome cover will result in damage of the part and no refund will be given for any used item or item with scratch on the surface. Please wrap the parts carefully before your return. Added to my 17 Texas Titan and looks great!